Cleaning out my desk last weekend I came across an old program for the Isle of Man Beekeepers Annual Convention. I was about to recycle it but thought I must have kept it for some reason… After a flip through I remembered why: there were several recipes at the back including those for various household products and confectionery using honey and beeswax. A perfect find for a rainy day. Of all the recipes listed, the one I was most interested in was the one for Furniture Polish. I’m on a mission to find replacements for as many of our toxic household substances as possible and a wood furniture a polish will come in handy. The problem with many conventional polishes is that they’re often loaded with chemicals. Ingredients that might cause immediate reactions or possibly long term health issues. On the National Library of Medicine’s website, furniture polish poisoning varies from dizziness, vomiting, and rapidly lowered blood pressure if the substance is ingested, to skin burns and vision loss if it comes into contact with your skin or eyes. Not a pretty picture. Look at how all the tiny scratches have disappeared. The best part is that I use this pestle and mortar in the kitchen & with this polish I won’t have to worry about accidentally ingesting toxic chemicals. Furniture polish of all kinds can contain lovely oils and waxes that help hydrate and protect. Most types also contain petrochemicals and other solvents that can get eaten accidentally (little ones) or evaporate into the air. Forgoing the Beekeeper’s recipe I decided to put together one of my own. I use just two main ingredients, beeswax and olive oil, and it can be made in less than 30 minutes. Afterwards it will take a couple of hours to cool. When combined, these simple oils form a semi-hard wax that can be massaged into most any wood to restore a beautiful sheen. Olive oil on its own can do this really well, albeit temporarily since it has a tendency to erode. Beeswax is much more durable and can give your furniture a long-lasting brilliant sheen and texture after regular application. Another ingredient that I encourage you to use is a clear Grapefruit seed extract (such as Citricidal) or Vitamin E oil though from a functional perspective it’s completely optional. Though Beeswax lasts years without going rancid, olive oil is much more likely to start go off. An anti-oxidant will help stop that from occurring and ensure that your polish continues to smell like rich honey-scented beeswax. 1. 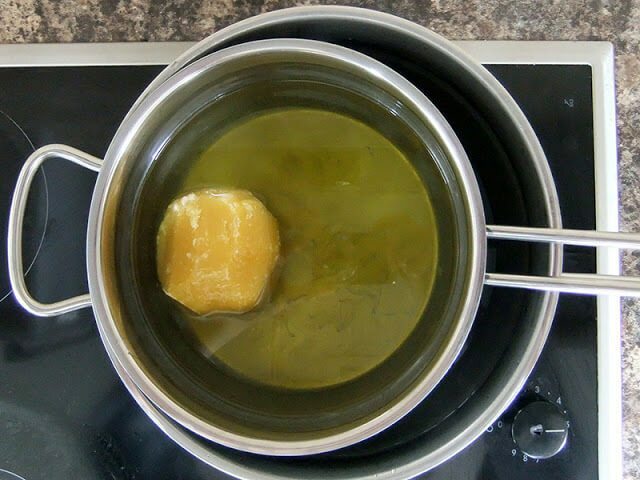 Place both the beeswax and the olive oil into a double boiler such as demonstrated in the image below. You can make a double boiler by floating a sauce pan inside another pan filled with hot water. You want your oils heated indirectly and evenly in this way because it’s safer for you and helps maintain the integrity of the ingredients. 2. Heat the double boiler/pans on medium heat until the beeswax is melted. Stirring it will help speed things up but don’t be tempted to turn your heat up too high. There’s a chance that boiling water will splash into your oils. 3. Add the anti-oxidant and essential oil and stir well. Pour the hot mixture into clean and dry wide-mouth containers. ** Allow to cool for at least two hours into a semi-hard balm consistency. 4. You can use the polish immediately and no doubt you’ll do what I did…run around the house looking for wooden objects to beautify! To use the polish, just scoop some of it out with your fingers or with a rag and work the polish into any and all wooden surfaces. You can wipe excess polish off immediately or leave it on for a couple of hours. That gives more time for the oils to permeate the wood. Buff it to a sheen afterwards and you’ll be delighted with how gorgeous the wood looks. ** If you’re making this as a gift and using glass jars you might want to warm your jars before pouring the hot oils into them. This will help keep the polish from pulling away from the interior of the glass which can be unattractive. Could this be used on toddler toys? I made a stocking toy for my grandson, and want to finish it with something like this. Also, Maybe a natural wood teether? If you make it with just the beeswax and olive oil then I think it would be fine. My daughter plays hockey and her hands get reallly dry. We love to use this recipe for dry skin. It works wonderful! Also, during commercial fishing it helps to keep the hands healthy. Hi Thank you so much for this wonderful recipe. We have kept bees for a couple of years now in the mountains of Serbia and are fortunate enough to be able to produce virgin honey (no chemicals within 12m radius) and first made some foot cream trying to help my eczema problem. U actually used fresh lard for this rather than olive oil because a neighbour gave me her recipe! Now I have made this wonderful polish and am thrilled with the results¬ Thanks again much appreciated from the foothills of the Valjevo Mountains in Serbia! By way my maiden name is Walton, from England ! Hi there, thanks for sharing this! Just one question – would PUre Grapefruit Oil work, rather than Grapefruit Seed Extract Oil? Grapefruit oil is a scented essential oil and different from GSE. You can just leave the GSE out though if you don’t have it on hand. Keep updating your article like that, I am eagerly waiting for something like that more.Your article helps me a lot in making homemade furniture polish.Thanks a lot. How long will it last in a jar and where is the ideal place to keep it? Thank you in advance. It will keep until the closest best by date of the ingredients you use — probably the best by date of the olive oil. Look on the back of your own individual product. As for storing, keep it in the same cupboard as your other cleaning products. Can this be used over chalk paint? 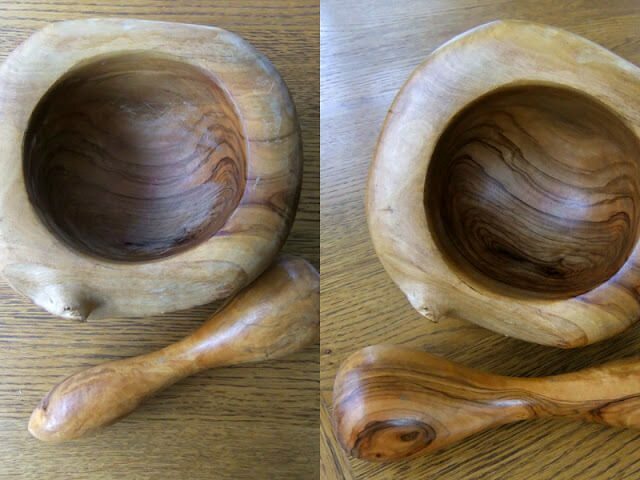 It’s probably best used on natural wood finishes — I’m unsure on how it would do over paint. Do you think it would work if I melted the beeswax in a slow cooker then added the olive oil & turned it off, instead of using the double boiler method? It depends on how hot your slow cooker gets. If it were set to low then it would probably work though. I’d put all the oils in together though rather than adding the olive oil after. Hi Tanya, I tried this polish and it is wonderful! I am about to make my second batch. I certainly didn’t have a problem with the oil becoming rancid because over the last 3 months I have used up the whole amount I made. This time, I am going to split it with a friend who has a wonderful wood beam mantel that will look stunning after a couple of coats. I do warm it slightly before using and also to release the essntial oils a little bit faster. I’m getting the scent of warm beeswax and essential oil just reading that — great idea Louise! Does grapefruit essential oil have the same anti-oxidant property as grapefruit seed extract? 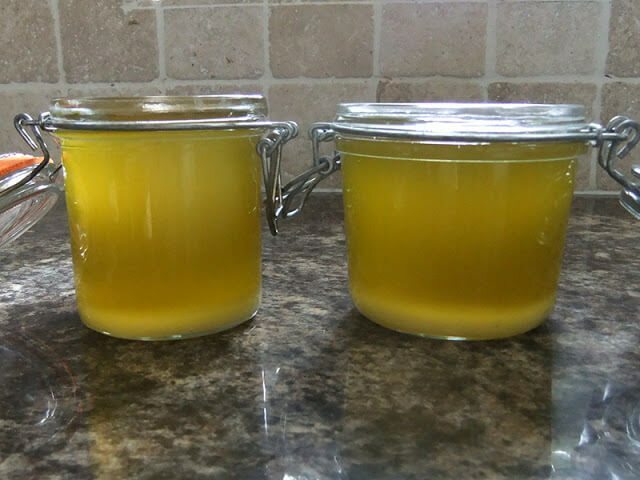 I used grapeseed instead of olive oil on my first batch but hubby used that batch up in a week and is asking for more, and I have plenty of olive oil, just no grapefruit seed extract or Vita E. Love this recipe! There are three different ingredients that you mention here: grapefruit essential oil, grapefruit seed extract, and grapeseed oil. All are very different! To answer your question, grapefruit E.O. doesn’t have the antioxidant properties as GFSE. It’s a fragrance rather than an antioxidant. Hope this helps. Hi Tanya, I was wondering if you could give me some advice on the natural beeswax furniture polish. I have my own beeswax from our own hives which I’ve cleaned and filtered so it’s nice pale yellow wax now. I have followed your instructions and recipe to the letter and I’ve even doubled the amount of essential oils but the scent will just not come out. I really can’t understand it. Hi Richard, the amount of essential oil is very low in this recipe so that it doesn’t overpower the scent of the beeswax. However, you could use up to a full teaspoon of e.o. if you wish! Though it may have antioxidant properties that make it as an oil last longer, it won’t have much of an effect on other oils. Best to stick with the stronger anti-oxidants. Wood this work on raw pine wood paneling, and it would also be behind a woodstove……so would it melt? It would be fine for that purpose Maureen and would not melt since you’d wipe any excess polish off the wood. Hi Tanya after making my move to the country, well a tiny village (not a single store for 6km) I finally got to polishing my old old mahogany piano with ebony and ivory keys (shame..) , more than 100 yrs old and really it has seen some days. I do believe no-one has cared so much for it before me. I haven’t been as gentle since my sons were babies. Right now it’s curing, soaking up this wonderful non-toxic, all natural polish. I had the bees wax from my former supplier of honey, a pensioner beekeeper in my old town. I had the grapefruit seed extract, the olive oil and I put a couple of drops of lavender EO in it. I wish I could post before and after shots here. Of course you were right. The house is filled with old pieces of wooden knicks and knacks and I am still polishing ! :). 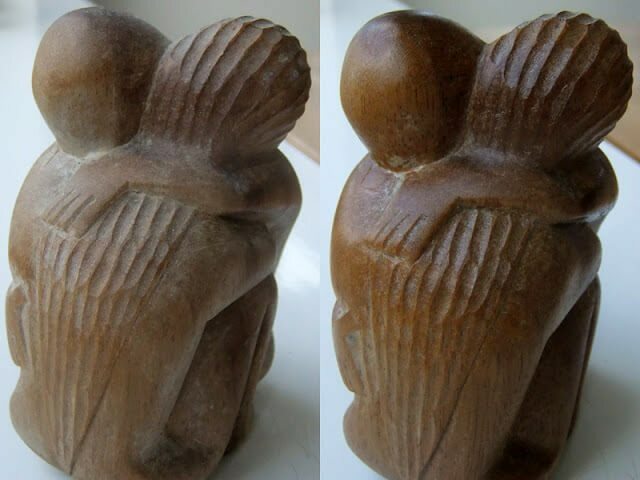 The next most important item is the baby’s rattle which has been passed down from older son to younger and then to grandchild, who has grown now. It is ash tree and got a proper shine and sits on a proud place on the mantle piece. Well I don’t actually have a mantle piece , just a bookcase, but it sounds better. I am very proud of the effort I am putting into polishing the piano. It takes elbow grease ( in danish-knuckle grease ! )and of course you follow the grain as much as possible. I actually feel as though I am doing it a favour and sort of healing it after all the scratches and cigarette burns and being knocked about. I always return to your posts and recipes even after scouring the Web. They are the best and I feel quite assured to use them. Thank you so much for all that you teach me about eco-friendly living. I am hooked. Hi Pia! I can almost picture your piano, baby rattle, and home – what a lovely description you’ve left of you making the polish and rushing around the house shining up your wooden pieces 🙂 So pleased to have helped with the recipe and thank you so much for the descriptive message and feedback. Have a wonderful day! 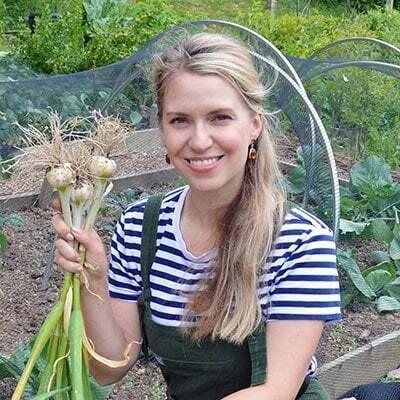 Hi Tanya, what are you using as an antioxidant? Vit C? 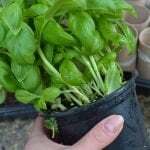 Thanks for your blog, it is good to know that there are a growing number of us out there changing the way we interact with the earth…no chemicals down the drain! You can use an antioxidant for this but olive oil and beeswax don’t really need them as much as other oils would. Be sure to get high quality Vitamin E if you do use it – many that are on offer are so diluted that they are not effective as an antioxidant. It’s actually better to use Grapefruit Seed Extract in my opinion. Hello. Thanks for this. 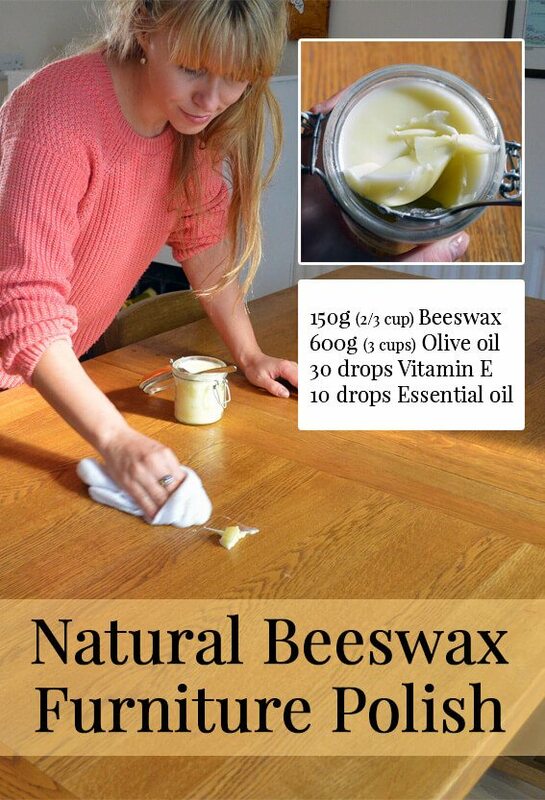 I use a similar concoction (just beeswax and olive oil) as lipsalve! 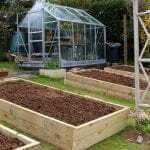 Works a treat, and no nasty chemicals. Lovely stuff! Hi to all, here all people are sharing this type of experience, so it’s good to read this blog; I daily visit this site to learn more awesome things. securityFastidious blog you’ve got here. I’ve ever been seeing you just about many blogs recently. Hello, Tanya..I am defo trying this recipe it is soo easy! I had read on another blog that someone used Grapeseed oil in their natural beeswax polish, in place of olive oil..if I remember correctly I *think* she said that grapeseed oil doesn't go rancid? Would you know if this is true or not? I have precious little grapeseed extract left till I can get to market and I use it in my fruit and veg cleaner. Can't wait to give it a go! Thank you! My floor looks much better! Brilliant polish! It's simply awesome that before and after pics! 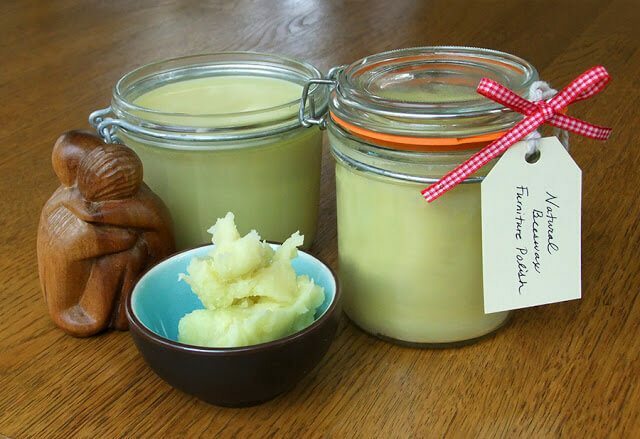 Have you tried using Mafura Butter combined with Olive oil as a natural wood polish. My friend made one and gave it to me as a gift and I absolutely love it. Natural beeswax furniture is environmental friendly. 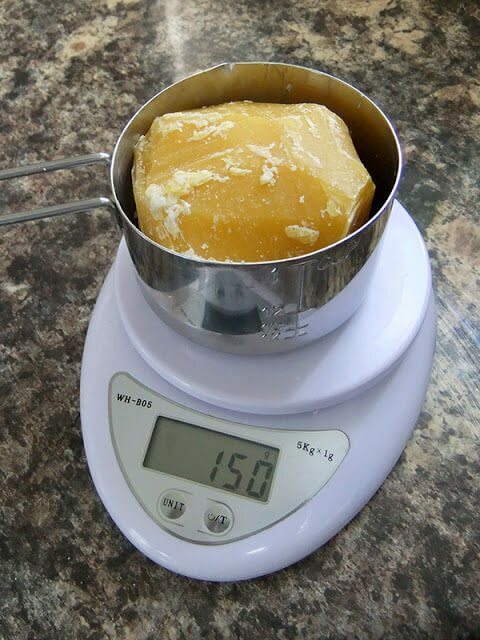 At home, beeswax exists as a good helper for the reason; it is so versatile especially in solving household problems. Your tips are beneficial in making natural beeswax furniture polish. Tanya, some people will react to Grapeseed extract. I know some medicines should not be taken with grapefruit products- e.g warfarin for anti coagulants, and although it is not being added for oral use in this case, it can be easily absorbed through the skin when being used as a polish, so Vitamin E or alpha tocopherol, which is the active anti-oxidant, would be better so I would suggest you remove Grape seed extract from your formula to be safe. Hi Martin, while there is a tiny chance that some people may have reactions to Grapefruit Seed Extract (GSE) the same would go for any of the ingredients. If a person is known to have pre-existing reactions to citrus fruits and GSE then of course Vitamin E is another option. What a great idea. 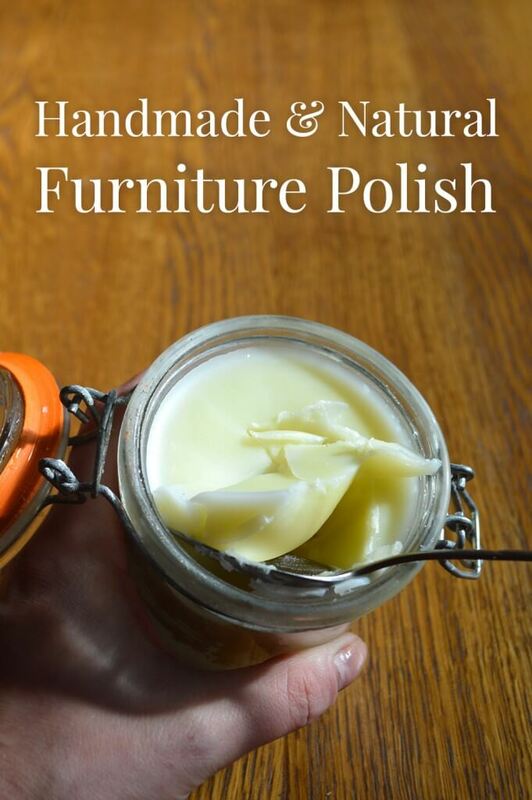 I use beeswax and olive oil to make herbal salves, why not furniture polish! That looks so gorgeous. It almost makes housework a pleasure. I will give this a try one of these days. Your wooden items have come up beautifully. Beautiful results on the wood, it looks lovely. I agree 🙂 Shining up the furniture is like putting the icing on the cake after a bout of spring cleaning. In researching further it seems that there are around three types of turpentine out there with varying ranges of toxicity – the cruder the extraction process from the tree material, the more toxic the turps will be. There's also the mineral turpertine that you mention but it could be counted as something else. I'm by no means an expert but have read that though some people use turps as medicine you should only use the turpentine oil that was distilled in the cleanest way possible – probably the method your former employer was using? Even then there are warning after warning on their use and personally I'd stay well away from it Read more about side effects. Also, the ordinary turps purchased in hardware stores is far more toxic and it's also the material that most people have access to. Use and inhalation of that stuff is what can result in all the nasty side effects I relayed in this post. Warning … turpentine and it's vapor is quite flamible. It could be quite dangerous to heat this with the double broiler method on the stove top. Extremely dangerous if your stove as gas. The open flame will certainly ignite the turpentine and bees wax mixture. Tanya – I have passed this on to a friend, who has bees. sunshine soap – it is the best soap he has ever used he says. I have some beeswax and was wondering what to do with it so this might be an option since you gave such good instructions! I haven't got the soap that you sent yet, maybe the government thinks it is plastic explosives or something and are running tests on it. We could become famous! You'll need to melt and clean your comb before you make this recipe though. I don't use the method I posted ages ago any longer since I found an easier way. If you'd like more info on that please let me know. The soap arrived yesterday, what a wonder scent! I am going to start the popcorn seeds when I get home, your plum tomato seeds are in the mail, let's hope they get there this spring! Thanks so much. Great polish Tanya. Unfortunately I don't tend to have much wood so this one I won't be trying out. What about a general furniture polish…found a recipe for that yet??? General furniture polish…for laminate, plastic, textile?